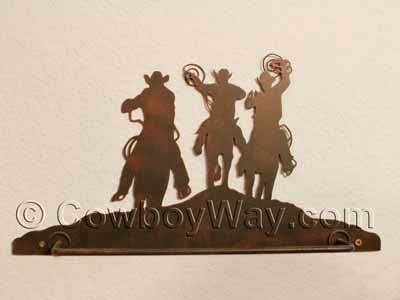 Below are cowboy, Western, rustic, and related towel bars for sale on Amazon and eBay. If you are looking for something personalized or custom, you might want to look for rustic towel racks in the Handmade category at Amazon. These items are from sellers that create unique, handcrafted items that can often be customized to your specifications. Below are a few good things to know before buying a towel rack on Amazon.com or anywhere else. How wide means......how wide? When a seller states the width of a bar-style towel rack are they referring to the the widest part of the rack or are they referring to the width of the bar? These are often two different measurements and may make the difference as to whether or not the towel rack will fit into the space you have in mind for it. Below: The widest part of this towel rack (at the bottom) is 18 inches. The bar, however, is only 13 1/2 inches wide. How big is the towel rack? Be sure to read the seller's description of the size (height, width, and depth) carefully. It can be difficult to get an item in the photos with the towel rack that can give you a proper perspective for size, so if you are only looking at the photos they can be misleading as to how big the rack actually is. What is the towel rack made of? Does it have a finish that will help prevent color or rust (if it's made of metal) from rubbing off onto your wall? How does the towel rack mount to the wall, and is mounting hardware included? Hint: Often the mounting hardware is not included. This usually isn't a problem as most towel racks mount with common hardware that is easily found at a local store, but you might want to make sure that you can find hardware, if it's visible after mounting, that matches the towel rack. How heavy is the rack? Will it securely mount to the location you have in mind, or will it be too heavy? Weight also effects shipping costs, so if shipping is not free be sure to know how much it will cost. Below: A horseshoe towel rack. 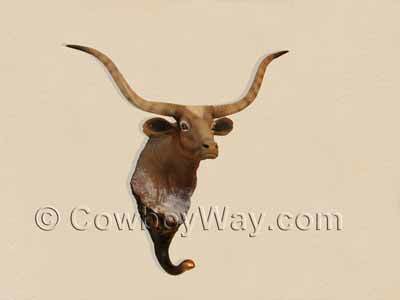 Below: A Longhorn cow towel rack. 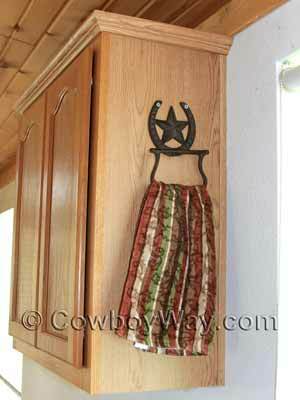 If you find a cowboy towel rack you like but you're not ready to purchase it right away, you can always add it to your shopping cart so it will be easy to find later. In most cases, Amazon.com will keep track of anything in your shopping cart for 90 days. In the meantime, if you want to check out with other items, click "Save for later" to move the towel rack to a separate, but still easy-to-find list beneath your shopping cart.